Pets come in all colours, shapes and sizes: dogs, cats, horses, rabbits, birds, iguanas, rats, snakes, guinea pigs, hamsters, etc. No matter how large or how small, our pets provide a unique form of companionship and support. For many, pets are an important part of the family; never questioning, always there during our times of need with a gentle paw or a nudge of encouragement. Unfortunately, their lives are too short compared to our own, and this reality breaks our hearts all too often. The pain suffered as a result of the death of a pet is very real. 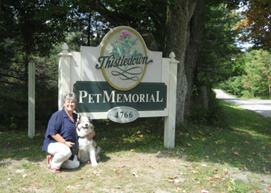 Thistledown is a resource centre for pet owners and their animal companions. We provide support as well as an affordable means of achieving closure following the death of a beloved animal. Our hope is that Thistledown will help ease the pain following the death of your special animal friend. Many pet owners find it difficult to imagine losing their beloved pet in advance of that fateful day. Please take a few minutes to visit our “Testimonials” link to see how we provided assistance to our clients before, during, and after the loss of their pet. The agony is so great …. and yet I will stand it. Had I not loved so very much, I would not hurt so much. But goodness knows I would not want to diminish that precious love by one fraction of an ounce.